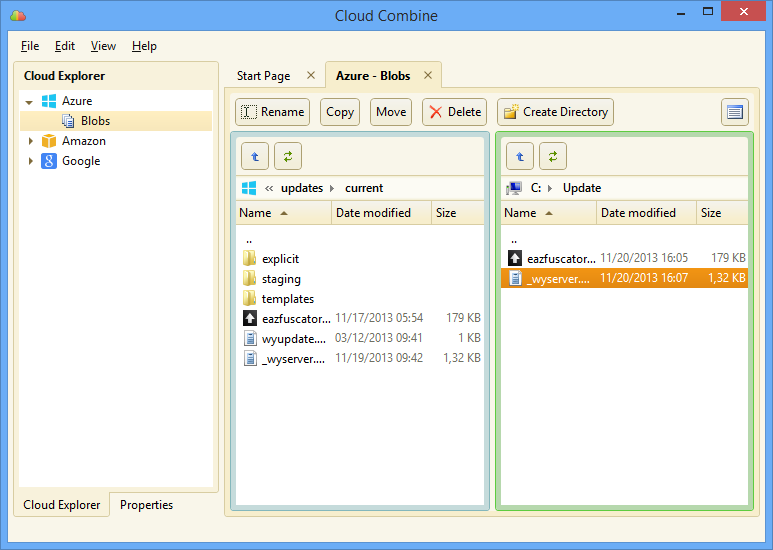 Cloud Combine allows you to browse your cloud storage in a way similiar to Windows Explorer. You don't have to think about the internals of Azure blob storage or Amazon S3 — you just do your regular file operations, we take care of the rest. 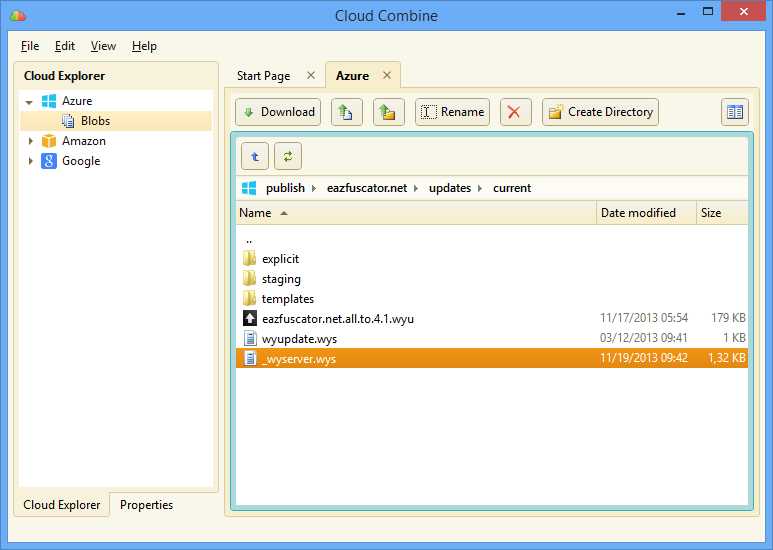 You can use Cloud Combine to download and upload data of any type and size. Just drag your files or folders where you want them to be. All the data transfers are fail-safe: we will continue trying until your data is in place. If you want to quickly move, copy or duplicate blobs inside your cloud storage, or migrate data between two different accounts or clouds, Cloud Combine handles this for you absolutely transparently — just the way you copy your files and folders on local computer. With Cloud Combine, you can manage your cloud storage settings (for example, S3 Storage Class or Server Side Encryption) easily. Cloud Combine provides simple and intuitive support for Amazon S3 versioning. It just works when you need it. Cloud Combine will execute several cloud operations in parallel to gain a significant speed-up when appropriate. Most of us are familiar with the standard file management tool: Windows Explorer. By default, Cloud Combine offers you the user interface similar to this standard. You just browse your cloud storage as if you were exploring your local drives and folders. If you want to download or upload file or folder, just drag it to/from a Windows Explorer window, copy/paste, or use Upload/Download toolbar buttons. Many power users have their favorite file manager applications: Total Commander, FAR Manager, Midnight Commander etc. All these applications use the principle of working with files in two panels, allowing the user to operate more quickly using only keyboard. We have brought the productivity of this approach to Cloud Combine by adding the double-panel mode. In this mode, you work with your on-cloud and local data side-by-side, and all the traditional keyboard shortcuts are supported. You can always easily switch between single and double panel modes.